The Census 2010 population of Census Tract 04013216813 was 4,041 (2,348 persons per square mile). See more about this census tract in context of other tracts using the Census Tract Demographics 2000-2010. View, rank, compare demographic-economic data similar to data in profile below using this interactive table. The profile shown below has been developed using the ProximityOne Outlook2020 software and API-based information resource. 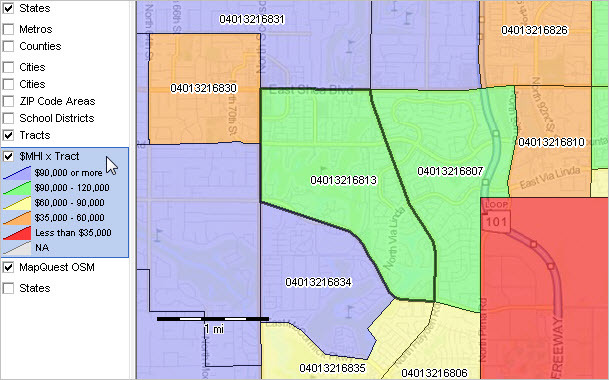 Outlook2020 can be used to develop this type of profile for any ZIP code area, census tract, city, county or school district. Outlook2020 provides access to ProximityOne estimates and projections to 2020. The table presented below shows demographic-economic characteristics for this place based on the American Community Survey (ACS). ACS provides post-Census 2010 annual updates for a wide array of demographic-economic data not available from Census 2010. ACS estimates are available for all geographies (U.S. wall-to-wall) using the 5-year estimates. For areas of 65,000 population or more, 1-year estimates are available. See more about ACS. Estimates shown in this profile are based on ACS 5-year estimates. See more about comparing these data over time.